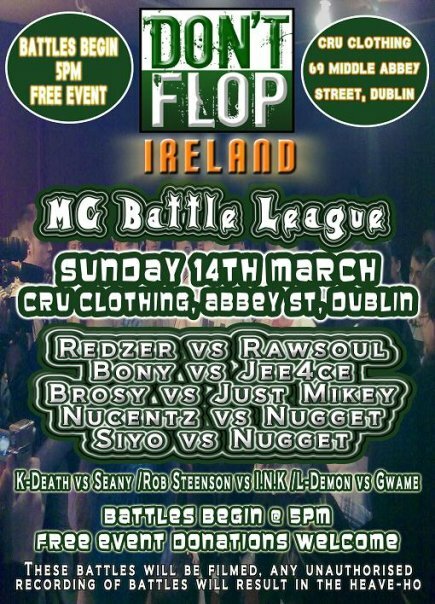 The second round of the Don’t Flop Ireland battle division is set stage to take place soon with some new faces joining the ranks. Jee4ce will be gearing up for his Don’t Flop debut and hoping to beat Cork man, Bony, who has already notched an impressive victory over Siyo in the last round. Rob Steenson and I.N.K. will be in close competition to show who has the better skills amongst the younger battlers and Redzer vs Rawsoul could be the biggest clash of titans to date. Also Nugget is looking to make up for the last round’s defeat to Redzer by taking on two competitors, Siyo & Nu-Centz! The event takes place on Sunday 14th March @ Cru Clothing, 69 Middle Abbey St, Dublin 1. Battles begin at 5pm sharp, please ensure you arrive in good time. Entry is FREE but all donations are very welcome. 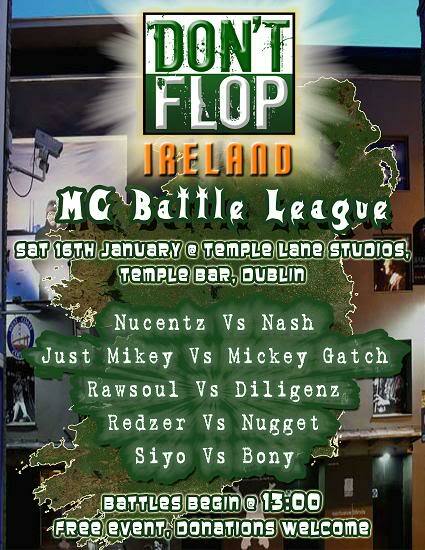 The first set of battles for the newly formed Don’t Flop Ireland division are now online for anyone who couldn’t make Temple Lane Studios, Dublin on 16th Jan. There was a great turn out for the event and the standard of the battles beat most peoples expectations. Shout out to Collie & Redzer for putting together the event, look out for the second round of battles on 14th March @ Cru Clothing, Abbey St, Dublin.